If you wanted to highlight the many ways Bridge Road Brewers like to approach the world of beverage making, this pair wouldn't be the worst place to start. One isn't even a beer (or wine or cider, both of which have left the Beechworth brewery at times in the past). Hopped Cola is Bridge Road's second non-alcoholic hopped drink, following in the footsteps of Lemon, Lime & Hop Bitters and taking a similar approach. To a pretty full and sweet cola they've added Galaxy hops, which themselves take on a sweeter character than the more tropical manner they come across in a pale beer, while also adding a bitterness that rises as the sugary cola flavours fall away. 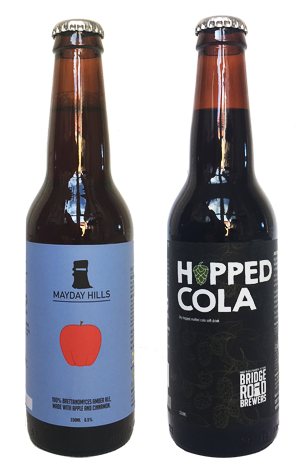 Apple is the latest release in the rapid-fire Mayday Hills series, fermented in the brewery's oak foeder with its house Brettanomyces yeast. This one features the caramelised reduction of 500 litres of local apple juice and cinnamon sticks, added to a red ale base. As you might expect, it conjures memories of baked apple and cinnamon pie or a toffee apple procured at a fair on a chilly autumnal eve, with the key ingredients joined by some caramel and chocolate flavours before a relatively potent, cleansing tang takes over. Throughout, the cinnamon remains eternal, as if it's 3am in the back seat of The KLF's Ford Timelord.